Lead. You don’t want it in your home or near your family. That’s where we come in. Here at Blue Springs Windows & Siding, we take every measure possible to keep your family safe from lead and lead poisoning. And we are serious about it. We have taken the proper courses and training to become a Lead Certified firm according to the standards set by the U.S. Environmental Protection Agency, or EPA. Here’s why you can trust that we will ensure your home stays lead-free while we work on your windows, doors or siding. Regular renovation, repair, and painting activities can disturb lead-based paint in your home. Activities like sanding, cutting, replacing windows, and more can create hazardous lead dust and chips which can be harmful to adults and children. Home repairs that create even a small amount of lead dust are enough to poison your child and put your family at risk. That’s why Blue Springs Siding & Windows has taken all the courses, filed all the proper paperwork, and followed all the designated precautions to become a lead-certified firm in windows, doors and siding renovations, repairs, and painting. You can trust that Blue Springs Siding & Windows will keep you lead-free. In order for us to be able to say we are a Lead Certified firm, we have to ensure that we have at least one certified renovator. We went the extra mile and made sure that every single one of our employees out in the field is certified. Each employee must pass an eight hour training course on lead safety every 5 years. Besides making sure our employees are all certified with training course hours, the EPA also requires that we take picture of our work for documentation, and fill out a Lead form and action plan if a home we are working on is painted with lead-based paint. These precautions ensure that we take every step possible to decrease the likelihood of lead getting into your home and near your family. 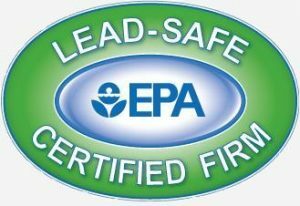 Before you hire a company to work on or renovate your home, make sure you ask if they are Lead Certified by the EPA’s standards. The U.S. government requires that all firms and companies performing renovation, repair, and painting on lead-based paint homes take these required training courses, and make it known to their customers. Otherwise these companies can face steep fines and other punishment. If you want more information on lead safety and certification, check out the EPA’s website. Call us today to ensure that the work on your home keeps your home lead-free. You can call us at (816) 228-5225.